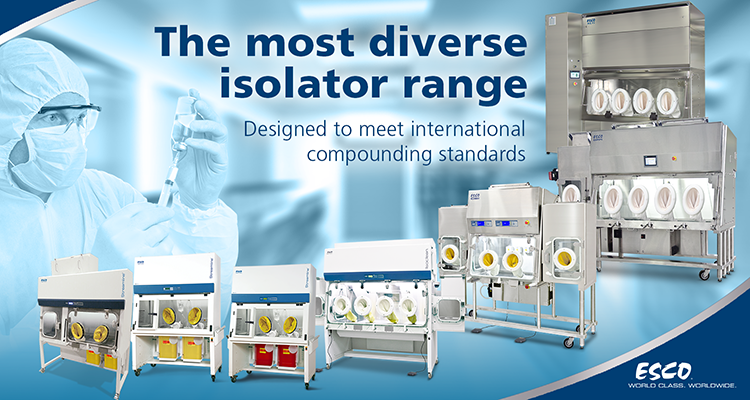 Esco Pharma is pleased to launch our latest range of isolators specifically engineered to meet the growing demands of pharmacy compounding (503A and 503B) industry. Esco has been designing and manufacturing systems of world-class quality for almost 40 years. Our company is the first to launch cGMP-compliant isolators into the pharmacy compounding industry in the United States, making Esco a proven market leader in clean air technology. All our isolators for pharmacy compounding exceed the demands of 503A/503B facilities and are compliant with USP 797/800 and FDA cGMP standards. Initially engineered for the pharmaceutical industry, these isolators are now used in pharmacy compounding applications, following the trend of stricter guidelines and practices. Esco Technologies, Inc will be showcasing this range of isolators in the upcoming ASHP Midyear Clinical Meeting 2016 in Las Vegas on December 04-08, 2016. Come and meet our team at Booth #471 to discuss your application and specific compounding needs.